You teach me baseball and I'll teach you relativity...no we must not. You will learn about relativity faster than I learn baseball. The man who regards life as meaningless is not merely unfortunate, but almost disqualified for life. When I study philosophical works I feel I am swallowing something which I don't have in my mouth. As the circle of light increases, so does the circumference of darkness around it. Heroism at command, senseless brutality, and all the loathsome nonsense that goes by the name of patriotism, how violently I hate all this, how despicable and ignoble war is; I would rather be torn to shreds than be part of so base an action! Generations to come will scarce believe that such a one as [Gandhi] ever in flesh and blood walked upon this earth. Any fool can make things bigger, more complex, and more violent. It takes a touch of genius -- and a lot of courage -- to move in the opposite direction. 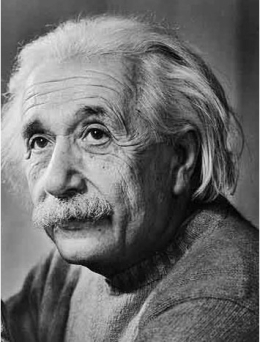 85 quotes by Albert Einstein.